The manufacturer says that this is "The World's only energy efficient pond heater! 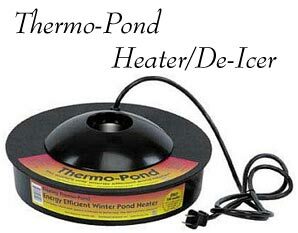 Thermo-Pond is a unique patent-pending pond heater that keeps a hole through the ice in backyard ponds for just pennies a day. In fact, Thermo-Pond can save you up to $30.00 a month in electricity! Just think, Thermo-Pond pays for itself in as little as 2 months. That's important, especially with today's soaring energy prices and in some cases, shortages. Thermo-Pond allows toxic gases to escape all winter long. Allowing that gas exchange can save the lives of the fish living under the ice. Thermo-Pond has been tested in the Northwoods of Wisconsin at temperatures dipping down past 30 degrees below Zero Fahrenheit." Thermo-Pond floats on top of the water and is thermostatically controlled to never get hot. Unlike some other heaters, Thermo-Pond will never burn a pond liner or plastic pond. 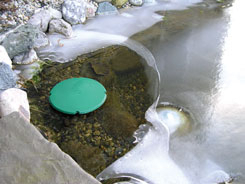 The hole in the top of the Thermo-Pond allows toxic gasses to escape all winter long. Allowing that gas exchange can save the lives of the fish living under the ice. 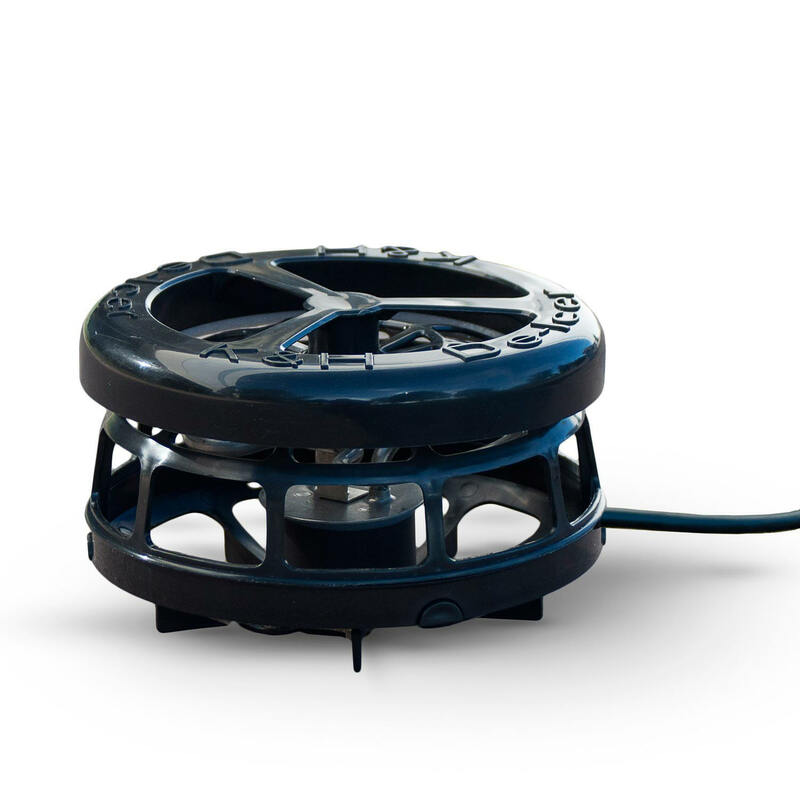 • Thermostatically controlled to keep your pond from freezing. Low profile design (only 1-1 /4”tall) minimizes wind resistance. Floats on pond surface. Field-tested in a 1500 gallon pond in sub-zero temperatures. Farm Innovators Heated Pond Saucer. Aquascape stainless steel 300-Watt Pond De-icer is ideal for keeping a small hole opening in the ice during cold winter months, and ensures proper gas exchange helping keep fish alive during the winter.